I'm very excited to announce that two MediaStorm projects I produced and edited have been nominated for the 31st Annual Emmy Awards for News & Documentary. 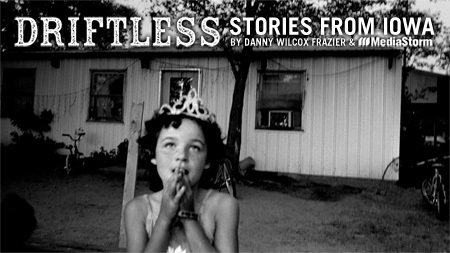 Driftless: Stories from Iowa by Danny Wilcox Frazier was nominated in the New Approaches to News & Documentary Programming: Documentaries category. Surviving the Tsunami: Stories of Hope was nominated in the New Approaches to News & Documentary Programming: Current News Coverage category. Congratulations also go out to my good friend and former colleague Bob Sacha whose MediaStorm collaboration with Reuters, Times of Crisis, was also nominated in the New Approaches to News & Documentary Programming: Current News Coverage category. The project includes brilliant interactivity designed by Tim Klimowicz. For a full list of nominees see the Emmy Award website.